Technical Sergeant John D. Kelly (8 July 1923 - 23 November 1944) was a U.S. Army soldier who was posthumously awarded the U.S. military's highest award for valor, the Medal of Honor, for his actions during World War II. John D. Kelly was born on 8 July 1923 in Venango Township, PA. 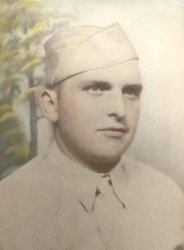 He joined the Army from Cambridge Springs, PA. On 25 June 1944, he was serving as a Corporal in Company E, 314th Infantry Regiment, 79th Infantry Division. At Fort du Roule in Cherbourg, France, that day, Kelly repeatedly exposed himself to hostile fire in order to destroy an enemy emplacement and capture its occupants. 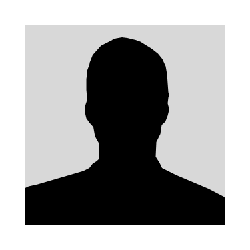 He was killed in action five months later, after having been promoted to Technical Sergeant. For his actions at Fort du Roule, he was posthumously awarded the Medal of Honor. 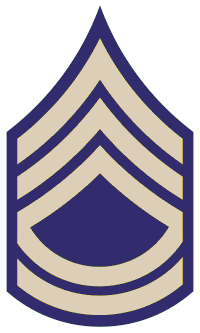 Rank and organization: Technical Sergeant (then Corporal), U.S. Army, Company E, 314th Infantry, 79th Infantry Division. Place and date: Fort du Roule, Cherbourg, France, 25 June 1944. Citation: For conspicuous gallantry and intrepidity at the risk of his life above and beyond the call of duty. On 25 June 1944, in the vicinity of Fort du Roule, Cherbourg, France, when Cpl. Kelly's unit was pinned down by heavy enemy machinegun fire emanating from a deeply entrenched strongpoint on the slope leading up to the fort, Cpl. Kelly volunteered to attempt to neutralize the strongpoint. Arming himself with a pole charge about 10 feet long and with 15 pounds of explosive affixed, he climbed the slope under a withering blast of machinegun fire and placed the charge at the strongpoint's base. The subsequent blast was ineffective, and again, alone and unhesitatingly, he braved the slope to repeat the operation. This second blast blew off the ends of the enemy guns. Cpl. Kelly then climbed the slope a third time to place a pole charge at the strongpoint's rear entrance. When this had been blown open he hurled hand grenades inside the position, forcing survivors of the enemy gun crews to come out and surrender The gallantry, tenacity of purpose, and utter disregard for personal safety displayed by Cpl. Kelly were an incentive to his comrades and worthy of emulation by all. Technical Sergeant John D. Kelly was killed in action on 23 November 1944. He is buried at the Epinal American Cemetery and Memorial in Épinal, France. His grave can be found in Plot A, Row 44, Grave 7.